Say what?! It’s week five of the One Room Challenge and I’m starting to sweat bullets! In case you are here for the first time, I’ve been designing my Foyer in our new house. Here’s a look at week one, two, three and four. There is good news and there bad news this week. Let’s just get the bad news out of the way first (sigh). Until late last week, I completely thought I had this challenge all under control. I’m a stickler for timelines and was realistic about what I could do with the Foyer within the amount of time allotted. But, sometimes even with all the careful planning and detailed timelines, things get out of your control. This is the reality of interior design. My carpet for the stair-runner (which is a showstopper!) is somewhere in customs and will not arrive in time for the photo-shoot (super sad face). I’m still not giving up hope that it does arrive and is installed before the final reveal, so at least I can take an image myself for you to see. Fingers and toes crossed. Now onto the good news! I’ve selected some fabulous artwork for the top of the staircase and landing. 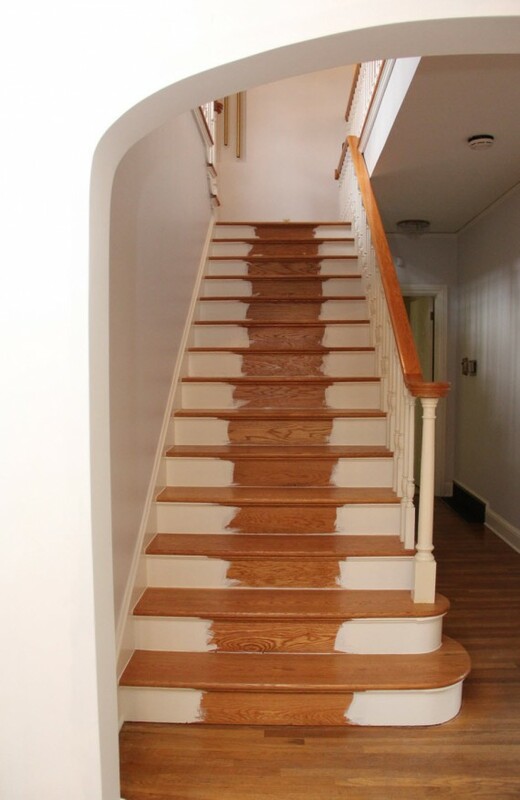 First, I’ll start with the top of the staircase on the second floor. 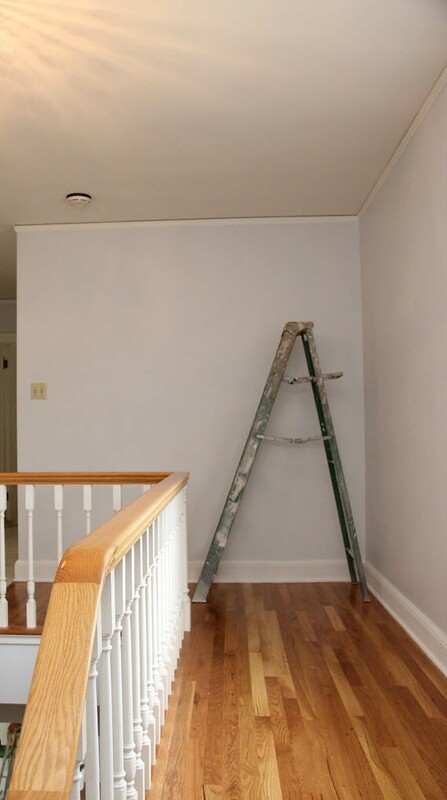 I knew from the start that I wanted a gallery wall at the top of the landing. I’ve adored Michelle Morin’s illustrations for some time and finally had the opportunity to create a gallery of her work. I selected 5 birds and one bee (had to!) for the collection and had them framed locally in a faux bamboo. Here’s a look at the arrangement before installed. Love, love, love them! The landing needed art desperately, yet was a very tricky spot because of the placement of the doorbell chimes. I could have done a couple things here; 1. Relocate the chimes to have more freedom for artwork or 2. Work with the chimes and place art one either side. I decided for option #2 because it was more cost effective and it didn’t change the original architecture of the home. Because the series of bird illustrations was already committed for the opposite wall, I wanted a pair of larger images to go on either side of the chimes. Here were some of the ones I narrowed down from another fab ORC sponsor, Minted (yes, they offer so much more than just beautiful holiday cards!). Selecting the two pieces for the space proved to be challenging. 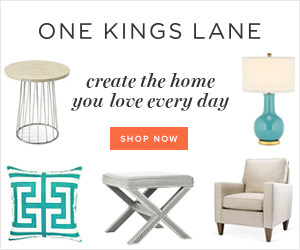 Minted has such an amazing collection, it was super difficult to narrow down. I knew I wanted color and an abstract. 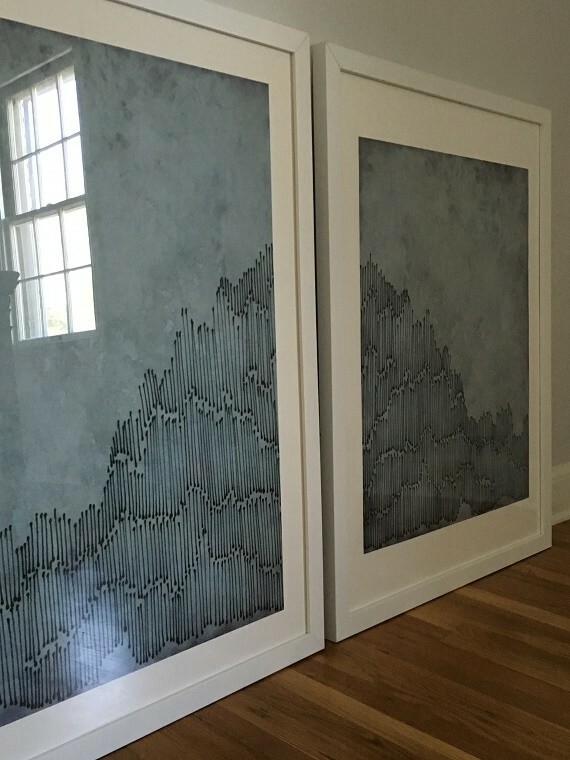 But finding two pieces of art that were complimentary, the same orientation (running vertical) and would work with the door chimes was indeed a challenge. In the end, I selected #5 a beautiful dyptich, High Cascades by Amelia Gluba. 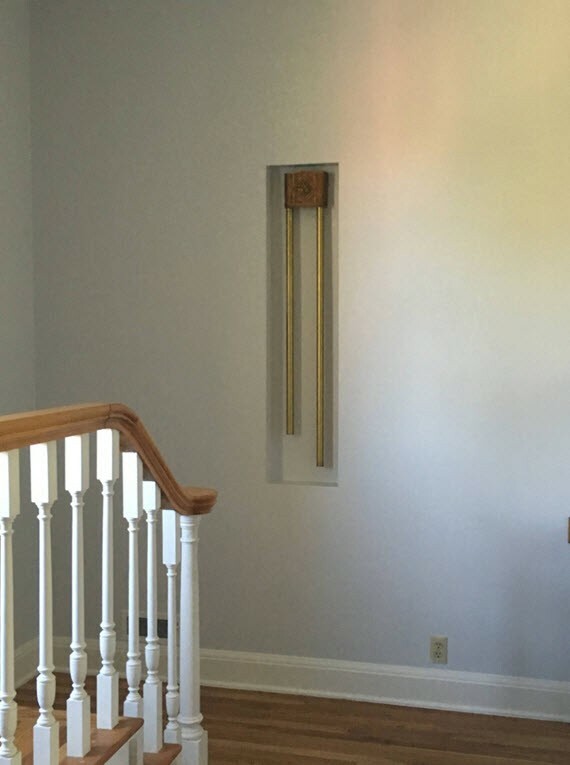 The abstract image works beautifully with the chimes, pulls blue from the wallpaper in the Foyer and gives a nod to the scenic Sierra Nevada Mountains surrounding our home. I quickly narrowed down the options to doormats that could be personalized. 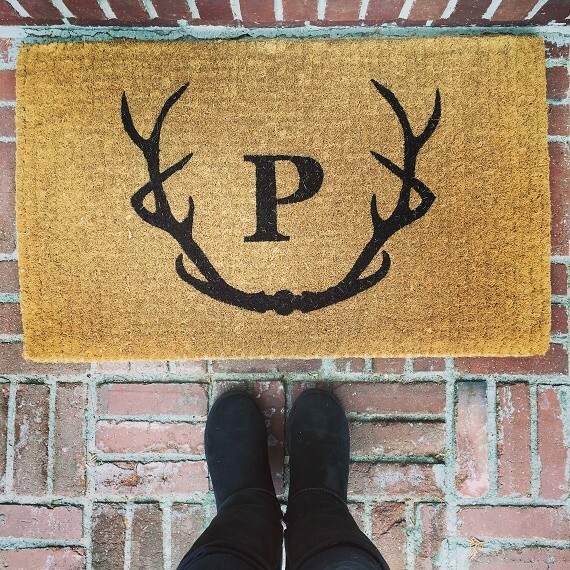 I’m a sucker for monograms so I ended up selecting the Antlers Graphic Doormat from Mark and Graham (a go to destination for fabulous personalized home decor). It’s was personalized with our family initial. Here’s the image I shared earlier this week on Instagram. Isn’t it perfect for a mountain house? I have a few other accessories to add to the Foyer before the photo-shoot this week. One is a floral arrangement for the console table. I’ve been going back-and-forth on what to do – traditional orchids? cut seasonal flowers? 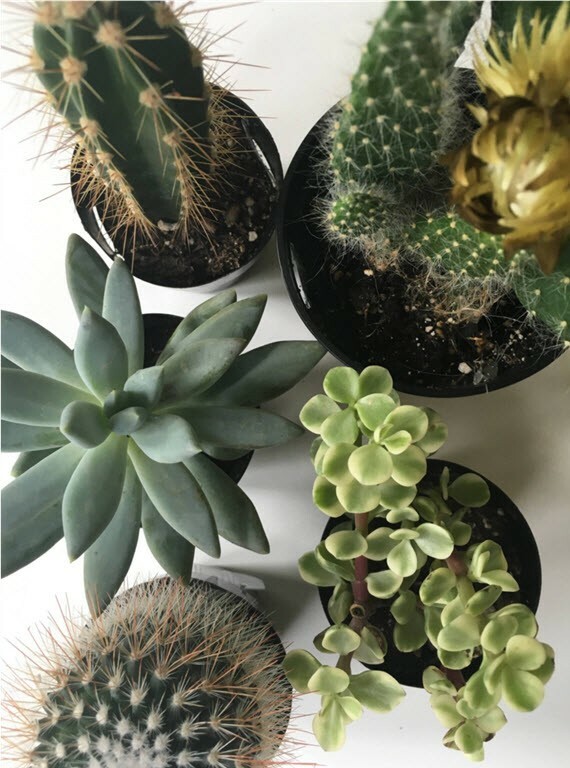 cacti & succulents? I’m still deciding. Again, I’m keeping hope that the stair-runner will be installed soon and would love for you to drop by next week to see the final reveal! Check out what the other ORC participants are up to – holy cow, there’s so much talent here! * Big thank you to Minted and Mark and Graham for their support and sponsorship of this challenge! Wow! Now,I can truly appreciate the work of art. I’m not good enough in color scheming but I love the color combination of the stair.Your such an inspiration. Keep it up! Oh! Ii love this artwork! Great WORK! 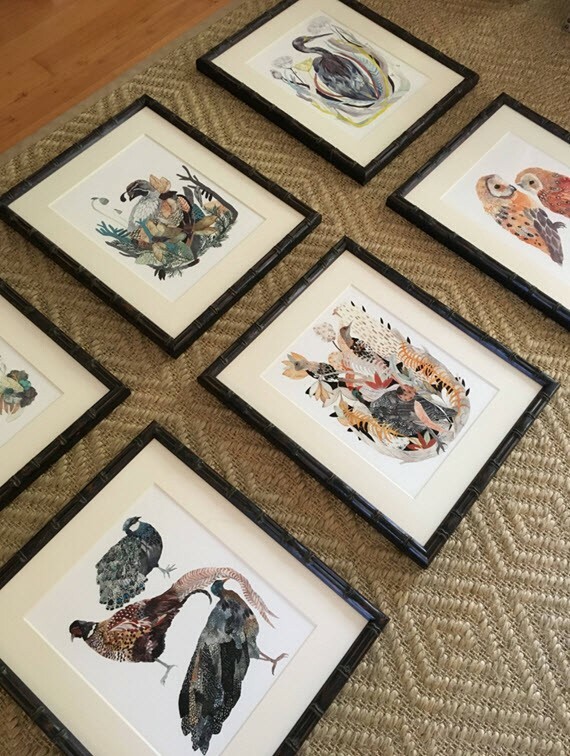 I love the bird prints – they are gorgeous! It’s coming together! I hope your runner arrives on time! I still keeping hope too! I love your choices. Good luck with the runner. I like your choices for artwork! They are a mix of mod with the Minted works and more traditional with the illustrations… Can’t wait to see it all come together next week! OMG….that is tragic! But you never know right…..it could just show up in time:) Love the minted art….how lucky are we to get all of these wonderful products! Looking forward to seeing how it all turns out next week. Seriously! The sponsors for the ORC have been AMAZING! Lucky duckies! My fingers and toes are crossed for you. I am so curious to see what the runner looks like. I love the art!! Thanks so much! Minted was amazing to work with as was all the OR sponsors!!! Boo stupid customs!! I’m missing a turkish throw as well, but that makes less of an impact than your runner. Fingers crossed it arrives for you. Even if it doesn’t the space will look great. Loving your art! Thanks so much Naomi! I appreciate your support! Love the art from Minted! Can’t wait to see the finished product. Good luck! Those chimes look like art themselves, so I’m thrilled you’re keeping them as is! And I’m excited to see the finished project, even if it’s after the challenge! That’s so sweet! Many thanks! Ooh, I love Michelle Morin’s artwork!! I just stumbled onto your blog because I was searching for the right print to put above our mantel now that I know she will do custom larger sizes (I already have one print and one of the pages from her calendar framed and hung on another wall). Good luck putting the room together. Isn’t Michelle’s work the best? The quality of the prints are amazing too!